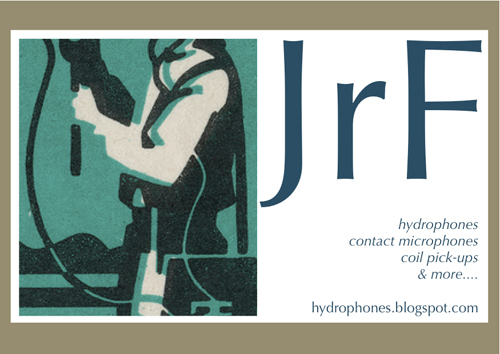 hydrophones, contact mics & coil pick ups. built by Jez riley French, an experienced field recordist & tutor on the Wildeye sound recording courses, JrF contact mics & hydrophones are used all over the world by artists, film & tv crews, universities, schools, wildlife trusts & fellow enthusiasts. The driving ethos being to make quality, reasonably priced units, allowing anyone to access fascinating worlds of sound hidden from the naked ear. tadpoles and water beetles, recorded at Froghall Wharf, Derbyshire - June 2013 with 2 JrF d-series hydrophones into a Sound Devices 7-series recorder.